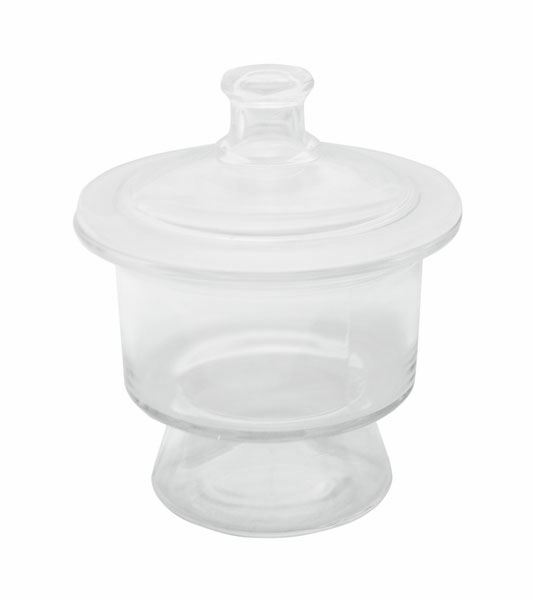 Desiccators are made of heavy, clear flint glass and have a ground domed cover with integral knob. Covers provide a tight seal for the contents, and the domed cover provides some additional vertical space. These heavy glass units are used in the laboratory for drying samples or protecting them from moisture through use of a Desiccant Cartridge placed in the lower compartment. A Desiccator Plate rests at the base of the upper compartment to provide support for the sample. Gilson’s selection of Desiccators includes 6, 8 or 10in (152, 203 or 254mm) models. MA-203 is 6x6in (152x152mm) WxH open, and 9in (229mm) high with lid. Volume is 30oz. MA-204 has a volume of 34oz and is 8x8in (203x203mm) WxH open, and 11.75in (298mm) high with the lid. MA-205 volume is 58oz, and is 10x8.5in (254x216mm) WxH open, and 12.75in (324mm) high with lid.